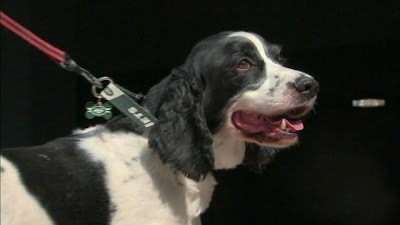 Late last week, Edith Lombardo-Albach of Staten Island, N.Y., was waiting to hear that her 6-year-old English Springer Spaniel named Hendrix had landed safety in Phoenix. Lombardo-Albach had accompanied the dog to the airport herself. He was traveling on a United Airlines flight in the cargo hold. "They marked everything Phoenix, and put the tags on Phoenix," she told ABCNews.com. Her daughter was waiting for the dog in Phoenix. But minutes before the plane was due to land, the airline called Edith. Hendrix would not be landing in Phoenix. "Originally, I thought the dog had died and I started screaming," she said. But Hendrix was fine, or thereabout. He had just been put on the wrong plane. He was going to Ireland. "I almost fainted," she said. "My husband and my daughter were already at the airport waiting for the dog." Yes, United Airlines sent a woman's dog to Ireland instead of Phoenix. The dog went exactly the wrong direction. United tried to console Edith, telling her "they were going to have someone clean the dog, feed the dog, walk the dog, and then they were going to get the dog back on the plane and send him to Newark." But Edith was beside herself. "The dog had already gone seven hours to Ireland, and now the dog has a two-hour layover and then a seven-hour flight to Newark," she said. "I was insane." Still, there was nothing to be done. Hendrix arrived in Ireland, got his walk -- and hopefully some pets and scratches -- then boarded another plane and flew back to New York. Edith met the dog at the airport at 11 a.m. and stayed with him until his 5 p.m. flight to Phoenix. Edith made sure Hendrix was on the right flight this time. "They boarded him the last possible minute they could," she said. "I stayed and watched them physically put the dog on the plane." Hendrix wasn't too happy about the whole thing. "He was fighting me to put him into the crate. That's just not like him," she said. What did the airline give Edith in exchange? A refund! "This was a major failure on United's part," Edith said. "He's a member of my family." United Airlines spokeswoman Megan McCarthy rushed to assure pet parents that the airline is not as incompetent as all get out. "Hendrix's experience is not typical of the service we provide to the more than 100,000 pets who travel with us every year," she told ABCNews.com. United Airlines Drops Ban on 9 "Dangerous Breeds"
Supermodel Maggie Rizer: "United Airlines Killed Our Golden Retriever, Bea"
Posted in IN THE NEWS, STRANGER THAN FICTION, WHAT THE FLUFF?